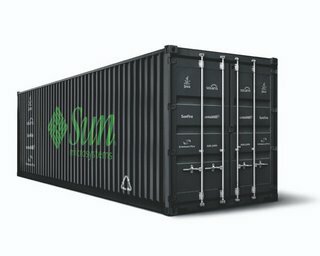 Sun's developing what they call a "blackbox", it's a container in which they crammed a full datacenter. It can be used just about anywhere and seems to have numerous cost and environmental advantages. The datacenter of the future? I'm not into servers enought to fully understand the impact of this, but I have a feeling that some network-based companies may like to put a blackbox anywhere close to their big customers. And that opens more opportunities for 'on-the-net' and 'not-on-the-desktop' applications. I can see SAP coming in at some big car manufacturer's mega-plant with a truck full of server and sell them a full enterprise solution without anything to install on any of the customer's computers (servers or PC's).